Affordable window updates are few and far between, but a hanging planter installed outside the kitchen or under a set of living room windows is a cheap way to add natural beauty to your home without emptying your checking account or planning out a major remodeling project. 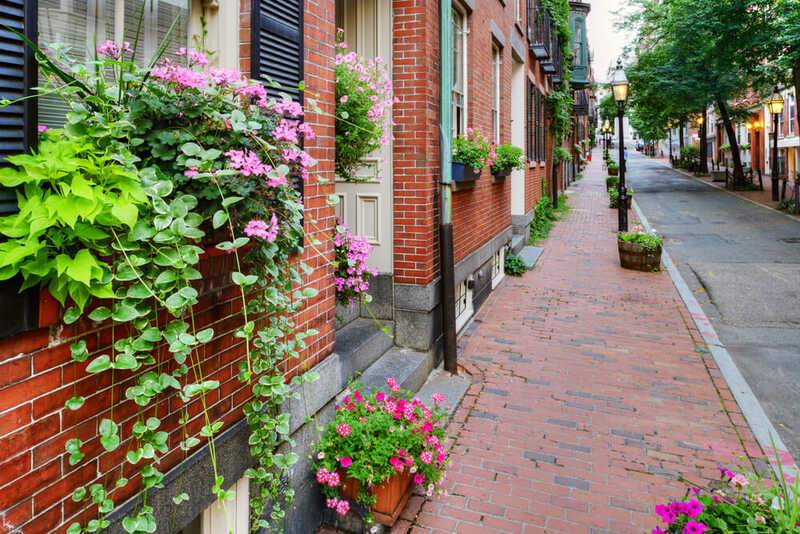 Window boxes are so simple, in fact, they can usually be constructed and installed at home—even if you’ve only handled a saw a few times. Still, they do require just a little bit of finesse to install properly. Here are some tips for getting the job done right. When you’re designing a window box, you want to take into consideration how the windows look from the outside, so if you have a pair of windows placed near one another, build boxes for both of them instead of leaving one bare—even if the windows are in different rooms in your home’s interior. If you’re purchasing a pre-constructed planter from the store, consider the color and style of your window frames, and how the box you select will ultimately complement them. You should also consider the architecture of your home—farmhouse trough baskets look charming in a cottage-style home, but clash with modern architecture, for instance. To help you make your decision, here are some of the most common planter styles, and their benefits and drawbacks. Wood: Classic wooden planters are simple and look great on almost any style home. They’re also easy to DIY, so they make a great afternoon project. However, they can be prone to rotting and may attract pests, so they’re not recommended for everyone. PVC, resin, or plastic: Plastic planters solve the problems presented by wooden planters—they’re naturally pest-resistant and more durable. They can also be molded into many different shapes and sizes. Not everyone is fond of the look of plastic, however. Vinyl: Vinyl window boxes are similar to plastic, but slightly more sturdy and durable, making them a better choice for homes that receive a lot of sun. Fiberglass: Fiberglass boxes most closely mimic the grain and appearance of natural wood, but are much more durable in the long run. Metal: Aluminum, wrought iron, and copper baskets and boxes offer a huge range of different styles and designs, and are generally a fuss-free option that adds a classically beautiful European elegance to the home. Materials: If you like the look of natural wood or don’t want to paint your planters, select a plan that calls for natural cypress or cedar wood. Measuring: The old adage of “measure twice, cut once” could not be more true than it is when measuring windows for a window box. Measure from the outside edge of the frame, and be sure to double check your measurements for accuracy. Support: Some hanging systems may require you to drill into your home’s siding, which you may not find appealing, particularly if you have vinyl siding. There are ways to get around this, however. For instance, vinyl siding hangers can be hooked into place beneath windows by sliding the edge beneath the siding and into place. Painting and Staining: If you are planning to paint or stain your homemade planter, make sure to do it well before hanging, so it has plenty of time to dry out in between. Unless you have vinyl siding, you’ll likely have to do some drilling to get the support brackets for your window box installed on your home. To begin, mark the mounting location for your planter by measuring at least one inch from the bottom of your window frame and marking it with a pencil. Ideally, your mounting spot should be near the edge of the first panel in your siding, but you can allow up to six inches for windows that swing outward. Make a mark for each bracket you intend to use—you’ll need at least two to hold the planter securely. Next, you’ll need to get out your drill, and attach a countersink bit to it—a specialized piece that will allow you to create a hole that is wider at the end so that the bolt, once inserted, can sit flush with the edge of the siding. First, drill a small divot, known as a “pilot hole” at the spots you marked off with your pencil. Once you’ve got your bearings, use your drill to create a full counterbore hole at each mounting location. Now you’re ready to attach the brackets. For wooden planters, a galvanized right-angle or L-shaped bracket is all you’ll need, since the hardware can be drilled directly into the back of the wooden box and hidden from sight. For wrought iron baskets and other containers, however, you may prefer to use decorative plant brackets, which have more visual appeal. For the most part, these brackets use the same basic methodology to attach to to your house, although they may hook onto the planter box, especially if you’ve bought a wire box. Using a 3-inch galvanized decking screw, attach the bracket to the siding, using a level to make sure that it’s completely flush. Do the same thing for your other brackets. Now, get out your level again, and check that the brackets sit level horizontally, as well, so that the planter won’t be crooked once it’s installed. Next it’s time to attach the wooden box to the brackets. Sit the box over the hardware, and and measure the distance from each bracket to make sure that it’s centered over the brackets. Step back to make sure that it’s also centered with the window frame. Use the same pilot hole and counterbore technique to prepare a hole for the screw in the box, taking care to make sure that the holes fit into the openings in the top of the right angle bracket. Screw the box to the bracket in each separate location using ¾-inch screws. Take a moment to congratulate yourself! You’ve just installed your first window box! 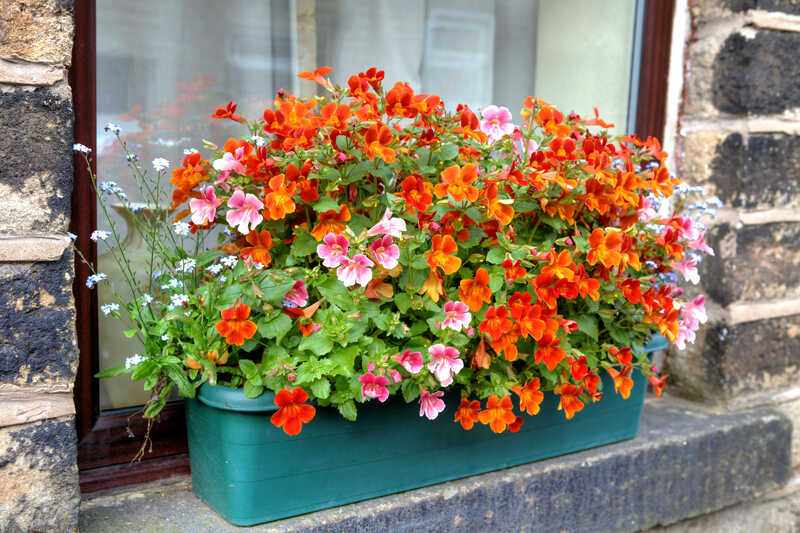 Of course, no window box can reach its full potential without plenty of nutritious soil and vibrant plants. To get there, either fill your box directly with high-quality potting soil, or purchase a wide container that will fit inside the box and add soil to that. You’ll probably want to get a container if your box is wooden—draining water can rot wood fast. Geraniums: Stately and classic, geraniums are common container plants that do well in fast-draining soil. Potato Vine: Trailing, eye-catching potato vines add interest to boxes, with foliage that runs the gamut from bright green to purple to nearly black. Coleus: Another ornamental, coleus can tolerate high sun, and makes a nice addition to fill out boxes. Snapdragons: Tall, tough snapdragons love full sun, and are relatively fuss-free. Verbena: Adorned with clusters of tiny flowers, verbena gives planters a dynamic, full look. No matter what plants you decide to go with, it’s important to check your planters often for moisture conditions. Container plants tend to dry out fast in general, and are often installed in locations with little shade, so they’ll need a lot of water. Beyond that, the only thing left to do is step back, and admire your handiwork. You’ve just given your home instant curbside appeal for under $100!